In this post, we’re going to be talking about why digital marketing is critical for lead generation. Let’s face it, everyone needs leads. No matter where you are, and no matter what industry you’re in, it’s leads or nothing. This is common knowledge. The problem is where to get quality leads. The simple answer: online. Source Disclaimer: The data for this post’s cover image is taken from research by State of Inbound. Image created by DigitalBullLeads.com. First off, we want to establish what digital marketing is for those unfamiliar with it. Digital marketing is the new age of marketing and can help you expand your customer base and increase your revenue. It complements as opposed to competing with traditional marketing viz. Billboards, banners, brochures, conferences, print ads, etc. Although telephone and radio ads are electronic, they don’t fall under digital marketing. Simply put, digital marketing refers to promoting your products and services online. If you are not online, you don’t exist. It’s as simple as that. Your digital platform acts as a leveler between SMBs and the giant corporations. The use of digital platforms has helped many Small and medium businesses rise fast and be on par with the big dogs. If done correctly, digital marketing can build your reputation and brand name. Having an online presence keeps you competitive. It is nearly impossible for your business to grow without digital marketing. Some of the other problems small businesses face include generating web traffic and finding time and resources for digital marketing. SMBs have a small workforce and less time for marketing. Therefore, they have a problem with marketing their products and services online. Companies may even disregard digital marketing because of the above reasons, which is unacceptable, and even foolish. Small businesses need to realize that digital marketing and online advertising are just as important as building a good product or service. Just having content online isn’t enough, though. It needs to be search engine friendly so people notice it. If you offer services locally, you could create local city landing pages for the areas you serve. You may also need to promote your site through search ads. If your website’s appearance is bad or your social media posts riddled with errors, people will be turned off by your company. You need to keep updating your website and putting out new content. When you harness the power of Google, your company will grow tenfold. However, you have to do it in the right way. This is where we come in with our SaaS solution. DigitalBullLeads.com is a digital marketing firm concentrating purely on lead generation. There are a lot of factors that set us apart from other companies. Chief among these is that we have our own digital marketing platform, DigitalBull GO. DigitalBull GO is a SaaS platform tool developed by DigitalBullLeads. DigitalBull GO helps you manage and keep track of your website and Google My Business Listing. This platform enables website and GMB content management, optimization tracking, Local SEO monitoring, analytics integration, reporting, and more. Through the DigitalBull GO platform, you can maintain your GMB and website content and update GMB posts, events, and offers to engage and increase your audience. Staying updated on your Google My Business Listing has never been easier. DigitalBull GO can help spread awareness of your business to improve your brand and increase your service area to enlarge your customer base. You check your Google Analytics, Google Search Console, and other reports all in one place – DigitalBull GO. DigitalBull GO isn’t a total corporate affair, and it can be utilized for students as well. We also offer practical digital marketing training for students in marketing universities and B schools through DigitalBull University. The bottom line is you want to increase your sales and revenue. The only way to do that is through leads. We will offer lucrative leads in a process that is appealing to you. Power your lead generation with DigitalBullLeads.com. DigitalBullLeads.com will assure a steady increase in your online presence and your revenue. Outsource your digital marketing to us and we will take care of all your digital needs. When it comes to digital lead generation, we lead the way. 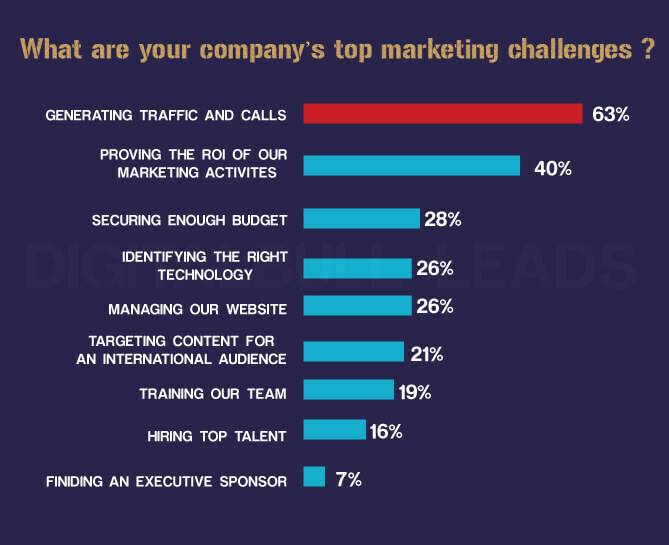 If you fall into the category of companies facing the top marketing challenge of generating traffic and leads, we are just what you need. We are a specialized digital marketing firm that offers lead generation services to small businesses and service area businesses. As stated previously, we have a custom-built platform, DigitalBull GO to manage your project every step of the way. Turn your website into a lead magnet via SEO, city pages, and search ads from DigitalBullLeads.com. Mail us, hit us up on Skype, message us on Facebook, or schedule a free consultation with us to get in touch. You won’t regret it!